﻿ Fun Easy English - new american english study practice reading writing survey poll opinion questionnaire do you consider yourself to be good looking. Home - Survey - Do you consider yourself to be good looking? Do you consider yourself to be good looking? Read the Instructions to take this survey. Then post a comment about this survey below . This is excellent reading and writing practice. Click Survey for additional topics. 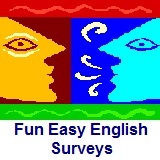 English language surveys are excellent reading and writing practice. Vote on as many surveys as you can.